Veteran radio and television journalist and popular lyricist Samaraweera Mudalige Don Premakeerthi de Alwis will be remembered and honoured at his 20th Death Commemoration which will be held at the John de Silva Theatre tomorrow (30) at 6.30 p.m. The ceremony named Thani Tharuwe is organized by the Premakeerithi Commemorative Committee. A collection of his much loved legendary lyrics written for radio and film songs will be sung by several leading vocalists at the event. 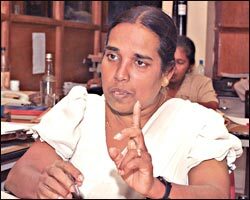 Sanath Nandasiri, Victor Ratnayake, Nanda Malini, Latha Walpola, Anjeline Gunathilaka, Malkanthi Nandasiri, Rupa Indumathi, Srimathi Thilakaratne, Rohana Weerasinghe, Rohana Baddage, Bandula Wijeweera, Neela Wickremasinghe, Edward Jayakody, Nirmala Ranatunga, Niranjala Sarojini, Priya Suriyasena, Priyankara Perera, Ranil Mallawarachchi, Ishak Beigg, Amal Perera, Kithsiri Jayasekera and Rodney Warnakula will take part in the musical ceremony. Music will be led by Jayantha Ratnayake. Some of the songs written by Premakeerthi for Television Muppet Shows by Titus Totawatte which are immensely popular among the younger generation will also be sung at this ceremony. Ba kiyala Ba kiyala Ba, Duwe Puthe Ba Kiyala Kisima Deyak Ne, is such a song. Senior artiste Jackson Anthony will deliver the keynote speech. The organizers offer an open invitation to the public for this event. The Premakeerthi Commemorative Committee has organized many a religious activity in memory of this legendary artiste over the last 20 years. A highlight of the event is the launching of the book 'Premakeerthi in Retrospect' (Premakeerthi - 20 years of remembrance) which has a collection of articles on the great artiste. The organizers have made arrangements for this book to be given away to Premakeerthi fans free of charge. What was the secret of Premakeerthi's popularity among radio listeners and television viewers alike? "What both listeners and viewers want is simplicity of expression," he had said. "My ploy was to intersperse traditional written language with colloquialism of folk tongues. I think it became very successful." The sprightliness of his language and its bend for original creativity enticed both viewers and listeners. Premakeerthi's father wanted him to join the railway service following in his footsteps. But Premakeerthi had other aspirations for his future. He used to lie in bed listening to radio and mimic news reading. His father saw his artistic ability and introduced him to Arthur U. Amarasena. Amarasena enrolled Premakeerthi as a feature writer in the cinema periodical Visitura published by Davasa group. 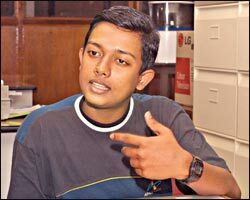 Later, the well-known radio artiste and lyricist Karunaratne Abeysekera turned out to be his mentor and he became part of the children's programs Lama Pitiya and Lama Mandapaya of Sri Lanka Broadcasting Corporation. In 1967, he became a relief radio announcer and was confirmed in 1974 as a Grade Two announcer. Thereafter, he became known as Podi Master and presented programs such as Sonduru Sevana, Serisara Puvath Sangarawa and Shanida Sadaya. Premakeerthi could not be described as someone good looking. When he approached the television medium, authorities had doubts about his appearance with his nala datha (extra tooth) and his television program on Rupavahini, Anduna, was presented hiding his face and only showing his eyes. The viewers became very curious to find out who he was. He became popular through the program and no longer could he be hidden and went on to present tv programs like Ayubowan and Sampath Rekha of the National Lotteries Board. Premakeerthi did not follow study courses in radio or television. What was the secret of his success? What he presented on mass media was what he had derived from folk literature and what he had learnt from both traditional and modern communication methods. He had a very lively manner of sharing with his listeners and viewers what he had experienced in his own life. Veteran lyricist Bandara Eheliyagoda said of Premakeerthi: "A song must be simple yet has depth and that is how a song becomes popular. Be it a love song or a Buddhist song or a song touching social issues, Premakeerthi used his own unique manner of expression. He used local folk language very well." 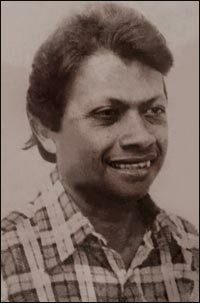 In 1969, he wrote his first song Hada Puda Asune sung by Rupa Indumathi and Malkanthi Nandasiri. His film songs begun with Kekulu Malaka Pethi Matha for K. W. Perera's direction, Lokuma Hinawa, counted about 160 films at the time of his untimely death. The freshness of his lyrics can be seen in his songs such as Muthu Menike, Devram Vehera, Minisaku Pita Negi Asaruwaki, Thani Tharuwe, Bindu Mathi, Sithin Ma Nosali Sitiddi Kandula Numba Evidin and Banen Benda Rajarata Pedesinne. His language was not meant only for the elite literate or only for small children or only for adults. He used his language to address both young and old, and both the illiterate and the literate, creating vocal balm to heal their minds. It is said that to compose a song, Premakeerthi only took the time required to light up a cigarette and smoke it. In that short span of time, he completed typing out the song on his typewriter. The late Dharmasiri Gamage had said this of Premakeerthi: "He was a person who could dwell on tragedies he had experienced in his life as blissful dreams. Tears did not unnerve him and pain could not deter him. Such an attitude is only possible for an artiste who can pick a flower from the pond of tears and disseminate its fragrance to the rest of the world." Preamkeerthi had an enormous number of requests to pen lyrics. It was not because he worked at the Sri Lanka Broadcasting Corporation and it was easier for him to play songs. It was because of his ability to be creative. Every sentence he wrote had a freshness of poetical expression. Premakeerthi made comic songs into an art form. "Sri Lanka has a tradition of comic songs," he said. "I have always felt that comic songs should be changed to a meaningful medium. These songs should not be comical but satirical. Satire is like a double-edged sword. While making people laugh, the comical situation can also be a critique of society. I wanted to see how the public will react to satirical songs." His first satirical song, Aluth Kalavak Soyagaththa Man Diyunuvenna One Nam, Nikan Inna Epa Kohoma Kohoma Hari Dapalla Ban Pethsam penned for the film Sujeewa and sung by late Freddi Silva is testimony to that vision. He did away with accepted traditions of news presentation and greeted people with new traditions of radio and television presentation. In that era, programs connecting listeners on telephone was not prevalent. Premakeerthi did that on his radio news program Sarisara and tested new manners of news presenting. "The attention span of any one on any sound is only 30 seconds. After that, attention breaks down." Premakirthi used this attention span of 30 seconds to the maximum as an announcer to break news on a topic. It is also said that he was present at a hotel in Anuradhapura during its December 31st dance. Crowds were dancing to a varied manner of songs which included Gunadasa Kapuge's song on the mother - Davasak Pela Nethi Hene Akala Vesi Eda Heluna. Premakeerthi approached the dancing young men and asked them not to dance but to listen to the song. They did so and one young man even had tears in his eyes. "Let the tears come," said a sensitive Premakeerthi. "It shows how you appreciate the song." On his 11th death anniversary, the Beddelanda Yaya village located in the Wellawaya Pradeshiya Sabha in the Monaragala District was inaugurated as 'Premakeeerthi de Alwis Memorial Village' by Premakeerthi Commemoration Forum and 'Premakeerthi Daru Rela' (Children of Premakeerthi) organised by his wife Nirmala and son Poorna Sampath.